This goes out to all my Arizona friends... 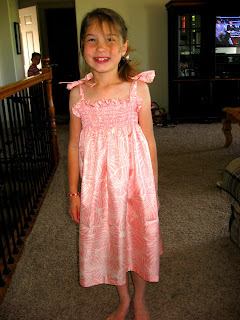 I made this smocked sun dress today after seeing this cute and easy pattern on Martha Stewart. You know me... I obsess about making these things and have made 2 going on 3. So, for Holly who gave me this Thai Silk in the first place... Thank You! Kristen - totally thought of you while making this... are you proud of me? RaDean, you totally need to make one of these for your little E. Aubri, don't you think Aliya would love one? And everyone else who has an inkling to sew... this is a way fun and easy project.... Sadie is looking a little ragged... but loves the dress. I've also made one for the neighbor, and am working on a shorter version for shirt for Sadie. Send me some fabric... I'll totally make you one. If you are rolling your eyes at me right now... keep in mind I do these kinds of projects for more reasons than one... like you know, keeping me out of the kitchen, keeping me pleasant with my kids, keeping my hands busy, and because I have learned to totally enjoy sewing and creating quick and easy projects. ahhhhhh!!!!!!!!!! Love it!! You did a great job!Looks fun! I'll have to try one myself!